So I heard it was the 8th International Baby Expo this time around, happening right in the heart of KL, over at KLCC Convention Centre. As Janice is already in her 2nd trimester, we figured it was good to go have a look around at what the expo had to offer. Little did I know I would be walking away with RM 300+ worth of baby products at the end of the "walk". There I was, at my first ever baby expo, one which I felt was rather big as it was held at hall 4 and 5 of the huge KL Convention Centre. 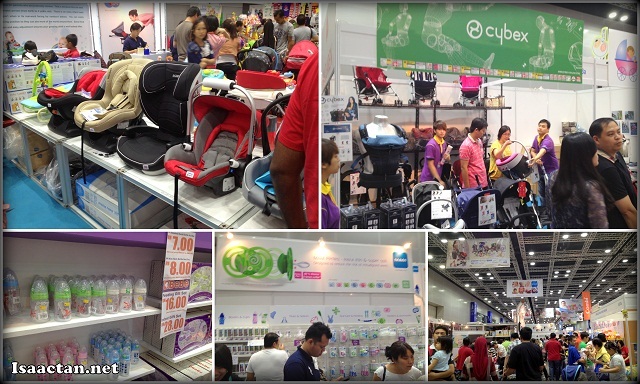 The crowd came in droves, all looking for good bargains of baby products. As far as my eye could see, there were parents, expectant mothers, and children all around. We had exhibits from a variety of baby products and services, as categorized below. "Since 2005, HareNet Co. has been hosting the largest parenting exposition in Malaysia. The 8th IBEX International Baby Expo 2012 will once again set to become the most influential trade and consumer show for the goods and services of maternity, babies and children in Malaysia." "As the pioneer in organizing parenting exposition in Malaysia, IBEX is covering the entire spectrum of childbirth issues, from conception through parenthood features educational seminars, exhibits, interactive games and contests." Going around the hall, we were spoilt for choice of baby items. In fact, some items like the baby wipes were really cheap going for only RM9 for 400 pieces. From what I heard usually it goes for higher. That was on top of other bargains available. As for me, I was pretty overwhelmed by the amount of mothers, expecting mothers, parents, and children. The whole expo had a carnival-like atmosphere to it, which sort of reminds me of PC Fair except instead of IT products, we had toddler seats, baby bottles, and diapers all around. Overall, I felt it was a pretty good expo, one which we could get some good bargains and prices for the consumable baby items. Do remember to drop by the International Baby Expo at KLCC tomorrow as that will be the last day. The expo runs from 10th to 12th August 2012. You won over RM300 or you bought? Well, bringing up a baby is not easy...and it is definitely not cheap. Do be prepared for that - save! But when they're all grown, you will look back at it all and sigh to yourself, "These are the best years of my life!" Been there, done that! NIce expo but i usually go for warehouse sale. Cheaper than expo. Some items at expo is more expensive that in the store especially things like milk powder. gratz for being papa and mommy soon! Again congrates bro. :D You will be very busy soon.